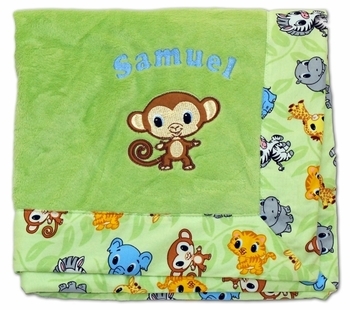 A lovely baby gift, this receiving blanket is embroidered with an adorable chibi monkey and child’s name in the corner. It’s made with two layers of downy soft sage velour fabric and also has cute chibi zoo animal trim. The blanket’s dimensions are 30 inches by 40 inches. See More Images for more pics of this adorable item. Name can have a maximum of 8 characters, including spaces. Processing Time 1-2 business days. Does not include shipping time.